Google Chromebooks and Ericom’s web-based RDP Client solution enable users to access Windows applications and desktops (virtual & physical) from Chromebooks, Chromeboxes and any other device running HTML5-compatible browsers. Flexibility & mobility – Enables users to access Windows applications and desktops in addition to accessing their Web apps - simultaneously, wherever they are! Windows Server 2008 / 2008(R2) / 2012 / 2012(R2) / 2016 / 2019 Terminal Services (physical or virtual). Both x86 (32-bit) and x64 (64-bit) are supported. Windows 7, Windows 8 and Windows 10 as remote desktops (physical or virtual). Both x86 (32-bit) and x64 (64-bit) are supported. ESG: TLS 1.0 disabled by default, can be enabled in the configuration if needed. Ericom AccessNow is an HTML5 RDP client written purely in HTML5. Eliminates management of end-point devices – no installation, configuration, management, update, patching, etc. Integrates Ericom RDP compression and acceleration technology delivering great remote access performance. Supports any HTML5 compatible browser on any platform, including Chromebooks, Windows, Mac, Linux, iPad / iPad mini, iPhone , Android, BlackBerry / Playbook and Amazon Kindle Fire HD, etc. How Does Ericom AccessNow for Chromebooks Work? Users open a web page and navigate to the relevant URL to launch the connection. The users enter their credentials and press 'Connect' — Their Windows desktop (or application) appears directly inside the browser window. That's it! 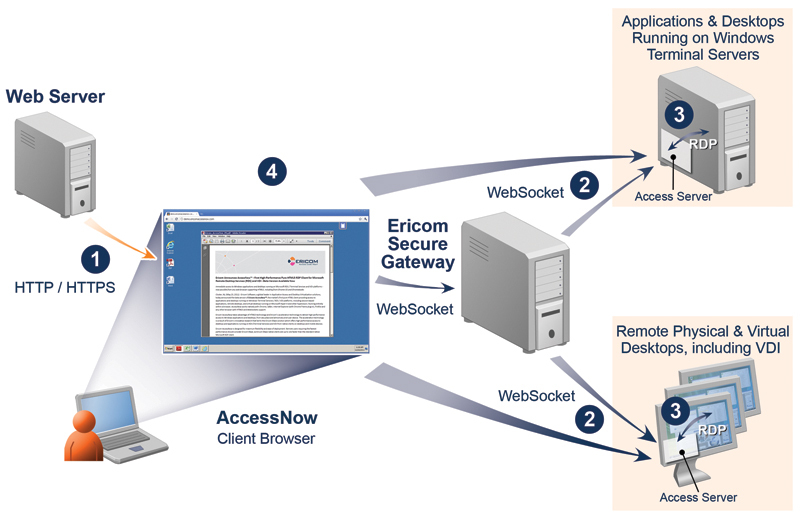 The client connects to the Ericom AccessNow Server using WebSockets – usually installed on the RDP host itself. RDP – Remote Desktop Protocol. A remote display protocol developed by Microsoft. RDP is a standard component of Microsoft Windows. RDP Host – a Windows system that can be remotely accessed using Microsoft RDP. HTML5 – a new update to the HTML specification. Extends HTML with new features and functionality for communication, display, etc. WebSockets – a bi-directional, full-duplex communication mechanism introduced in the HTML5 specification. SSL – Secure Sockets Layer is a cryptographic protocol that provides communications security over the Internet. Chromebook - mobile device running Google Chrome OS. The devices comprise a distinct class of personal computer, falling between a pure cloud client and traditional laptop. Printing – Supports printing from remote host to the Chromebook. Printouts open as Adobe Acrobat reader (.pdf) files in new browser tabs. Users can easily send them to local printers, save them, email, etc. Ericom respects your privacy. We will not sell your information to other companies. Please make sure that the user you've entered is the one used for past Ericom registration and try again. If still doesn't work please register as a new user.